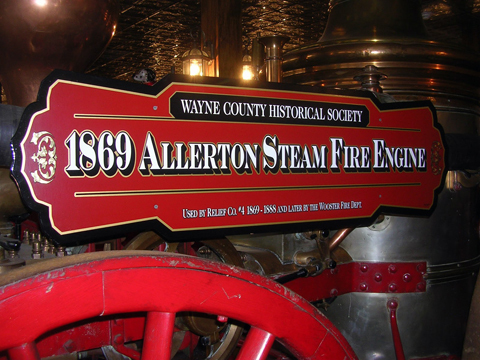 Plaque on the 1869 Allerton Steam Pumper located in the WCHS Firehouse. Recently Ken Foran, Designwear Division Manager at F.J. Designs Inc., spent a cold winter afternoon in the Wayne County Historical Society Firehouse. He and his wife meticulously measured and photographed the 1869 Allerton Steam Pumper on display in our Firehouse. Foran had been sub-contracted by the Model Expo company to design a small scale model of the old steam pumper. Model Expo, founded in 1976, is a leading manufacturer and provider of historically accurate and authentic model kits and precision tools. The company serves more than 40,000 customers and hobby stores throughout the world. They are expanding their Model Trailways line of Western Transportation Kits with a line of Fire Apparatus Kits. The first offering in this line will be the 1869 Allerton Steam Pumper. Ken Foran, designer of their Model Trailways Buckboard Wagon, is well underway in designing the Allerton Steam Pumper and they’re hoping for a late summer 2013 release. We are sure this is going to be one of his finest creations. The WCHS hopes Model Expo will allow Foran to donate a copy of his design plans, once completed, to the society. Recently aquiring one of these model kits and wanting to build it to museum quality as well as original accuracy I have been struggeling trying to locate someone who can answer questions or share pictures about this. I have attempted to get to the site that the webmaster has given above (scalemotorcars.com) but this site must be down permantley. I have attempted to contact Ken Foran in many different ways as well. I am desperate and would really like to finish this and submit it to my local museum for display or fire department here in central Indiana! Hope someone can help! I have lost count on how many emails I have sent out about this in the past two months! So I am looking for build info on Model Trailways 1869 Allerton Steam Pumper or how to contact Ken Foran. I have tried to contact him via his facebook account but without him “liking or accepting” me on there I cannot even say one word to him.